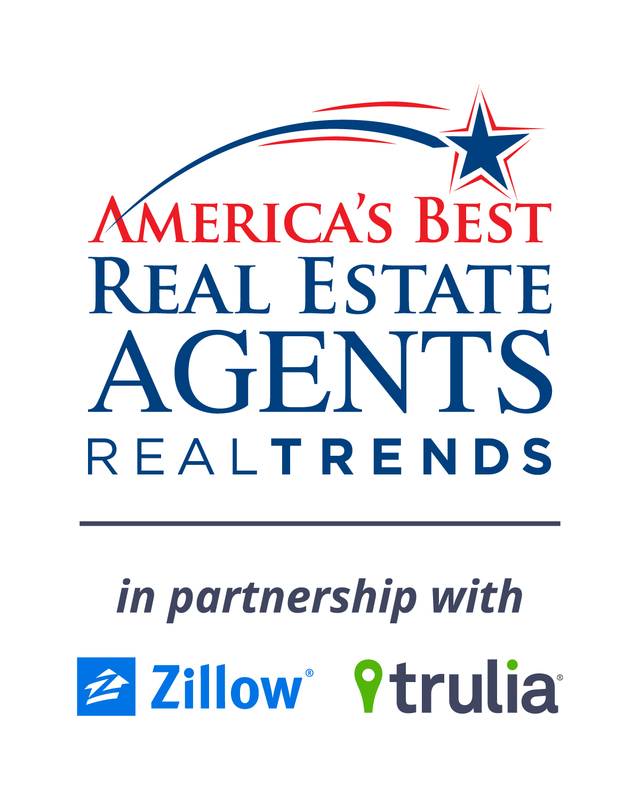 (June 11, 2016) Kevin Bradley, Melinda Duncan, Christopher Conn, Maggie Taylor, Donna Elder, and Lynn Ransdell of RE/MAX Creative Realty were named among America’s most productive sales associates as a part of REAL Trends America’s Best Real Estate Agents, the newly issued ranking report produced by REAL Trends and sponsored by Zillow Group. They are now members of “America’s Best Real Estate Agents,” and ranked numbers 3, 38, 40, 49, 94, and 97 (respectively) for Kentucky. 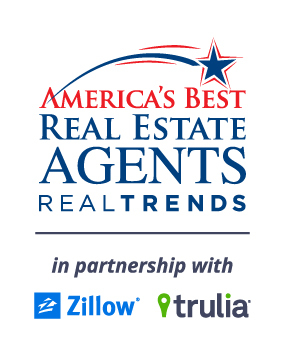 REAL Trends America’s Best Real Estate Agents ranks over 12,000 residential real estate professionals solely based on their excellence in real estate sales during calendar year 2015. All production numbers are independently verified by a third-party in order to ensure accuracy and report integrity. This group of highly successful real estate sales agents represents less than 1 percent of all real estate practitioners in the United States. To qualify for inclusion, an individual agent must have closed at least 50 transaction sides or $20 million in sales volume in 2015. For real estate agent teams, the minimum is 75 transaction sides or $30 million in closed sales volume. REAL Trends is a Castle Pines, Colorado-based real estate publishing and consulting firm that offers a wide range of research and advisory services to the residential real estate industry. 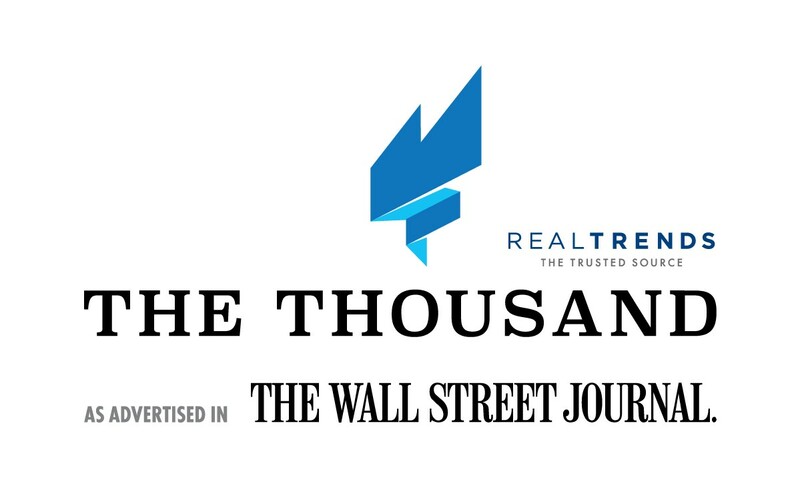 Recognized as the leading source of trends in the industry, REAL Trends also publishes the REAL Trends The Thousand, as advertised in The Wall Street Journal and the REAL Trends 500, which ranks the top brokerage firms in the United States. (June 29, 2016)—Kevin Bradley of RE/MAX Creative Realty was named one of America’s top real estate professionals by REAL Trends, as advertised in The Wall Street Journal. He is now a member of the “The Thousand Top Real Estate Professionals,” a prestigious national awards ranking sponsored annually by REAL Trends and advertised in The Wall Street Journal. Bradley is now ranked in the top one half of 1 percent of the more than 1.1 million Realtors® nationwide. According to The Thousand, Bradley had transaction sides totaling 135, ranking him 233 in the nation. “The best individual agents and teams—including Bradley’s award-winning efforts—were nothing short of phenomenal considering the challenges in today’s complex housing market,” said Steve Murray, founder of REAL Trends, a Denver-based consulting, publishing and communications company and The Trusted Source that complies the yearly, third-party verified list. 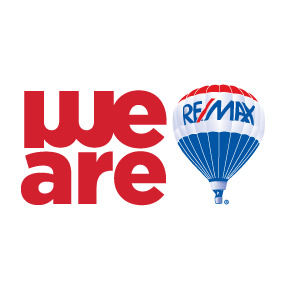 About RE/MAX Creative Realty - RE/MAX Creative Realty is a locally owned and operated full-service real estate brokerage located in Lexington and Georgetown, Kentucky. Founded in 1987, the brokerage has over 70 Realtors® and specializes in both Residential and Commercial real estate. RE/MAX Creative Realty is a proud supporter of the Kentucky Children’s Hospital via the Makenna Foundation, and is headquartered at 2808 Palumbo Drive, Lexington, KY 40509. To learn more, please visit www.GoCentralKyHomes.com. About The Thousand - This awards program was developed jointly by WSJ. Custom Studios (and is not affiliated with the Editorial Department) and REAL Trends, a leading source of analysis and information for the residential real estate brokerage industry. 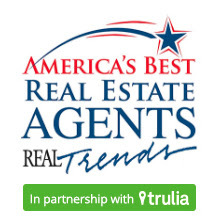 REAL Trends The Thousand honors America’s elite real estate professionals and their companies and is compiled and analyzed by REAL Trends with a special ad section included in The Wall Street Journal. LEXINGTON, Kentucky, February 12, 2016 – Maggie Taylor, with RE/MAX Creative Realty, has been presented with the RE/MAX Lifetime Achievement Award, which honors highly successful agents who have earned more than $3 million in commissions and have completed seven years of service with the company. Less than six percent of the RE/MAX network has achieved this prestigious award. 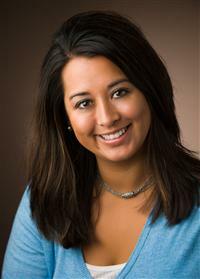 Melinda Duncan, also with RE/MAX Creative Realty, has previously been honored with this award. Taylor has been working in the real estate industry for almost 16 years and has extensive experience in new construction and resale. “Maggie has been an integral member of our team and is more than deserving of this very prestigious award,” said Janice Mueller, Broker/Owner of RE/MAX Creative Realty. RE/MAX is the most productive real estate network with its Sales Associates averaging more sales than other real estate agents. Over 100,000 agents provide RE/MAX a global reach of nearly 100 countries. Nobody sells more real estate than RE/MAX. RE/MAX Creative Realty is a locally owned and operated full-service real estate brokerage located in Lexington and Georgetown, Kentucky. Founded in 1987, the brokerage has 68 Realtors® and specializes in both Residential and Commercial real estate. RE/MAX Creative Realty is a proud supporter of the Kentucky Children’s Hospital via the Makenna Foundation, and is headquartered at 2808 Palumbo Drive, Lexington, KY 40509. To learn more, please visit www.GoCentralKyHomes.com. LEXINGTON, Kentucky, February 12, 2016 – Frank Mason, Shelley Paterson, Tony Phillips, Lynn Ransdell, and Ned Werling, with RE/MAX Creative Realty, have recently been presented with the RE/MAX Hall of Fame Award, which honors successful agents who have earned more than $1 million in commissions during their careers with the company. Less than twenty-three percent of all RE/MAX Affiliates have earned this prestigious award. Only 23 agents in Central Kentucky have earned this award to-date, 16 of whom are affiliated with RE/MAX Creative. These agents join Margaret Carmickle, Melinda Duncan, Greg Edmondson, Donna Elder, John Groft, Shelia McCoy, Louis Mulloy, Trina Penn Padgett, Maggie Taylor, Bernie Utterback, and Linda Waldroop-Lewis. These agents have been working in the real estate industry for many years and have extensive experience in new construction, remodels, resale, and farms. “Winning this award is a tremendous accomplishment. These agents continue to raise the bar in real estate, making us, and this community, proud,” said Janice Mueller, Broker/Owner, of RE/MAX Creative Realty. Have you ever noticed how everyone seems to be #1 at something? That's marketing for you! Don't you want the Realtor selling your home or helping you buy your next home to be the most experienced in the business? Count on a full-time professional with a history of success. That's the sign of a RE/MAX agent. 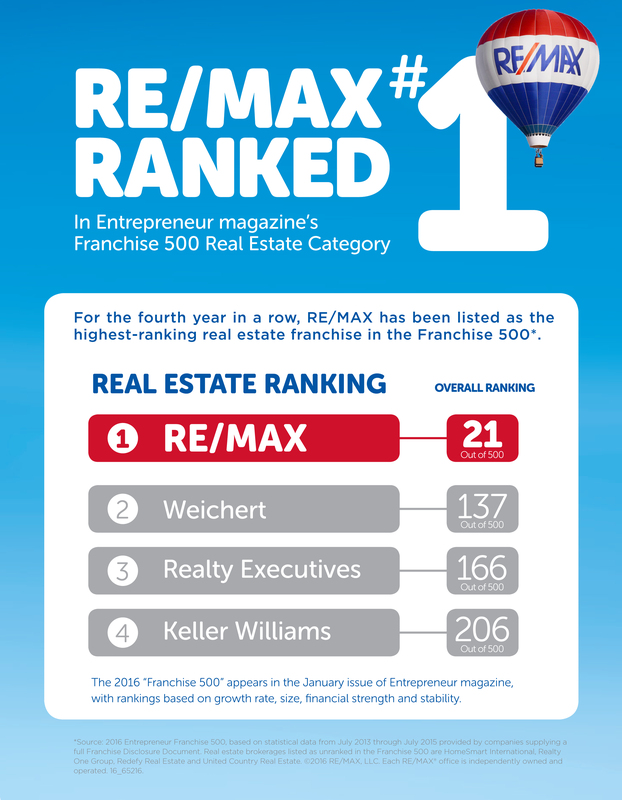 It's official, RE/MAX has again been listed as the highest-ranking real estate franchise in the Franchise 500 Real Estate Category, and ranks #21 among all franchises - a significant jump from #75 last year. Be sure to read the press release! 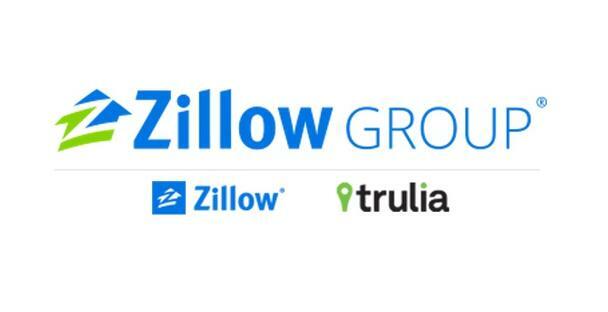 SEATTLE — Zillow Group, (NASDAQ: Z and ZG), which houses a portfolio of the largest and most vibrant real estate and home-related brands on mobile and web, today announced it has renewed its agreement with RE/MAX®, one of the nation’s largest real estate franchisors. The newly expanded agreement features a first-of-its-kind integration of two of the Zillow® Tech Connect programs, Leads and Reviews. Now, RE/MAX agents will be able to receive Zillow Group leads through their customer relationship management program, LeadStreet®, and will be able to feature their reviews from Zillow on their personal agent websites. In addition, agents will have extended RE/MAX branding with attribution on all listings across Zillow and Trulia® and agents will be clearly labeled as the listing agents on the buyers’ agent list on their listings. Zillow Group will also offer specially designed training and education regarding these new resources to RE/MAX agents. All 59,000 RE/MAX agents in the U.S. will have the opportunity for their listings to appear on Zillow and Trulia, as well as on Zillow’s and Trulia’s popular suite of mobile apps. Listings will also appear across Zillow Group’s extended network, which includes Yahoo!® Homes, MSN® Real Estate, AOL® Real Estate, HGTV® and Leju. In addition, the new agreement allows RE/MAX listings to feature unique brokerage branding, including a logo and link back to the brokerage website. Kevin Bradley, Melinda Duncan, Donna Elder, and Tony Phillips! REAL Trends ranks, collects, and verifies all of the data in these reports to produce a completely unbiased and ethical report. REAL Trends is a consulting and communications company for the residential real estate industry and has been widely known as the trusted source for data, news, and trends for the residential real estate industry. 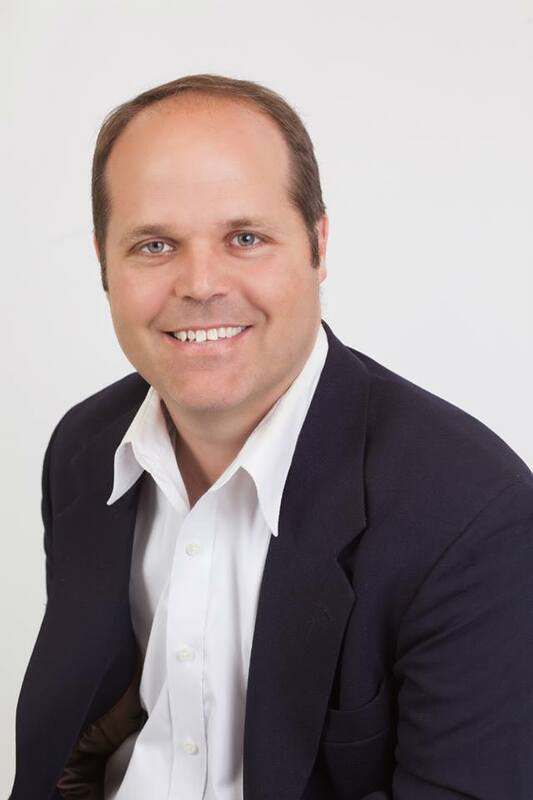 Eric Pruitt wants everyone around Palm Beach Garden, Florida, to know he’s back with RE/MAX after a five-year hiatus. So much so that he’s completely wrapped his F350 pickup as a mobile billboard touting his team and affiliation with local franchisee RE/MAX 1st Choice. Pruitt speaks from experience. In 2009, after 21 years with RE/MAX, Pruitt and his team embarked on what he hoped would be a lucrative new affiliation with Keller Williams. He had no choice, he says: The RE/MAX broker he’d been working with for years advised he was two months from closing doors on his franchise, and the housing market was in the throes of the recession. He joined a Keller Williams franchise with the promise of profit sharing and reduced costs at a time when it seemed the entire industry was in need of a refresh and relaunch. “Everyone was in survival mode, looking for the most affordable way to stay in business,” he says. At first, it worked. Costs were manageable, enabling Pruitt to weather the worst of the economic storm. But in ensuing years, as Florida housing slowly made its recovery, he started to recognize some things he’d surrendered when he left RE/MAX. As the ranks of novice Keller Williams agents in his area swelled, Pruitt found it increasingly difficult to differentiate himself and his team from the pack working under the same banner. When a former client called to have Pruitt list his home, and then cancelled after learning he was no longer affiliated with RE/MAX, Pruitt grew more attuned to the power of brand. He wondered about other listings he wasn’t getting. Last year, when his broker ran an ad for luxury homes but would not include Pruitt’s name and contact info alongside his listings, he began contemplating his return to RE/MAX. By then, Pruitt had heard Bill Wilkinson, another of Florida’s top producers who had left for Keller Williams, was back at RE/MAX and thriving again. They compared notes on their experiences and frustrations. “One thing he pointed out to me is that, at RE/MAX, you’re surrounded by top producers, and there’s a synergy and mindset that goes with that,” Pruitt says. Then, there’s the power of the brand. Pruitt notes that RE/MAX is one of the most recognized names in real estate. Talks with other agents reinforced Pruitt’s perceptions, and he briefly explored purchasing his own RE/MAX franchise. Ultimately, Pruitt decided to concentrate on what he enjoys doing most – working directly with buyers and sellers. His search for the right opportunity eventually led to discussions with Broker/Owner Bill Brady and Broker/Manager Abe Himelstein of RE/MAX 1st Choice. Their approach resonated with Pruitt, and the fact that ample space for Pruitt and his six-member team was available in the same building as their offices cinched the move. Pruitt agrees. Since officially transitioning back with his team in February, he reports taking more calls on listings than he had in the previous year. In his first three months, he estimates he had $17 million in pending sales. 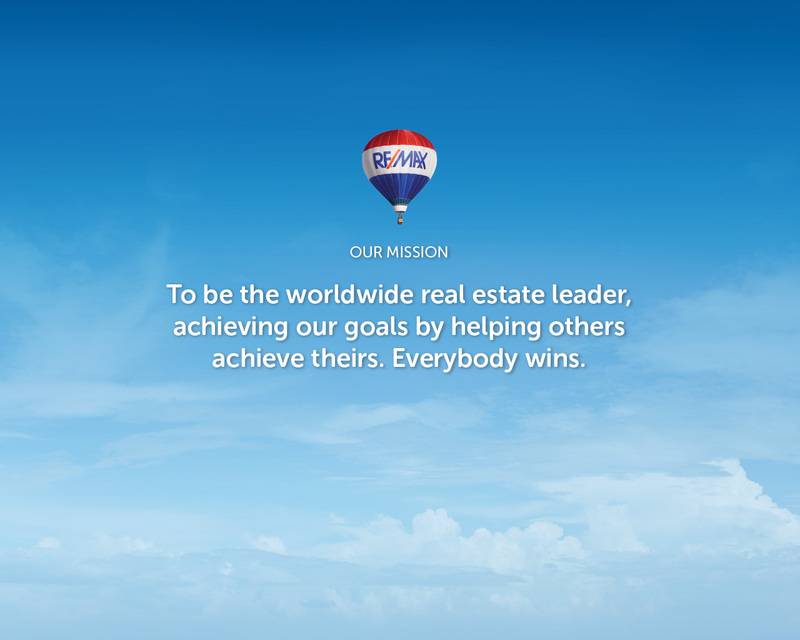 DENVER – The global real estate franchisor, RE/MAX (NYSE:RMAX) now counts over 100,000 agents in its network. Ending 2014 with 98,010 agents worldwide, RE/MAX attracted more than 2,000 agents in just the first few months of 2015 to reach this significant milestone. RE/MAX agent growth picked up steam in 2015 and as of April 1 had risen 2.1%, after increasing 5.1% in all of 2014. RE/MAX continues its trend of agent growth while the National Association of Realtors reported February home sales at levels 4.7% higher than one year ago. “In an improving market, the most productive agents will want to affiliate with a recognized brand that supports their efforts with valuable resources and innovative technology tools,” Liniger added. The best agents seek out organizations that can help them succeed in a competitive environment. RE/MAX provides a comprehensive training platform, RE/MAX University, that is available 24/7 on-demand anywhere in the world. RU has been recognized with numerous training and video awards. And since 2006, RE/MAX has provided over 14 million online leads to its agents without a referral fee. Other services include a creative advertising campaign and the RE/MAX Design Center, an online marketing site where agents can create customized materials using professionally designed templates. 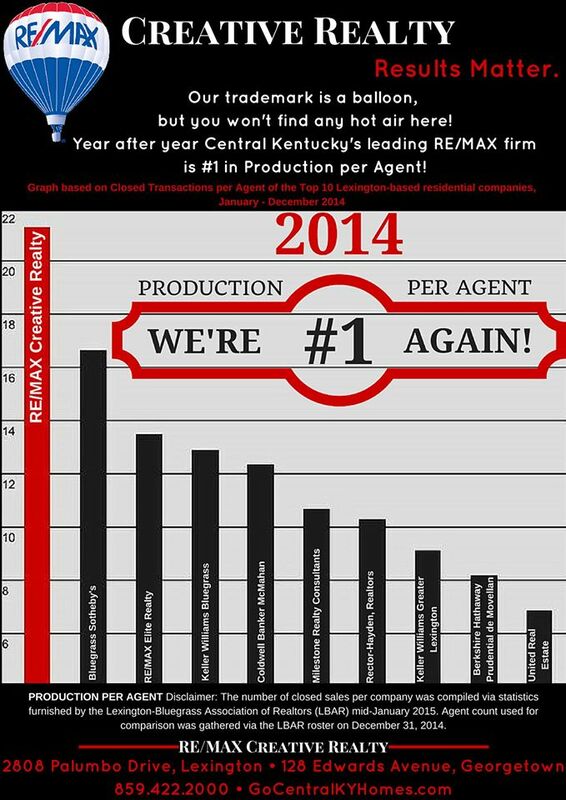 RE/MAX agents consistently rank among the most productive in the industry. In the United States, RE/MAX agents averaged 15.6 years of real estate experience and 16.0 transaction sides in 2014. Selling five Master Franchises in 2014, RE/MAX reached around the world to nearly 100 countries. No other real estate brand can match this global footprint. It remains true that nobody in the world sells more real estate than RE/MAX. Over 100,000 agents provide RE/MAX a global reach of nearly 100 countries. Nobody sells more real estate than RE/MAX. 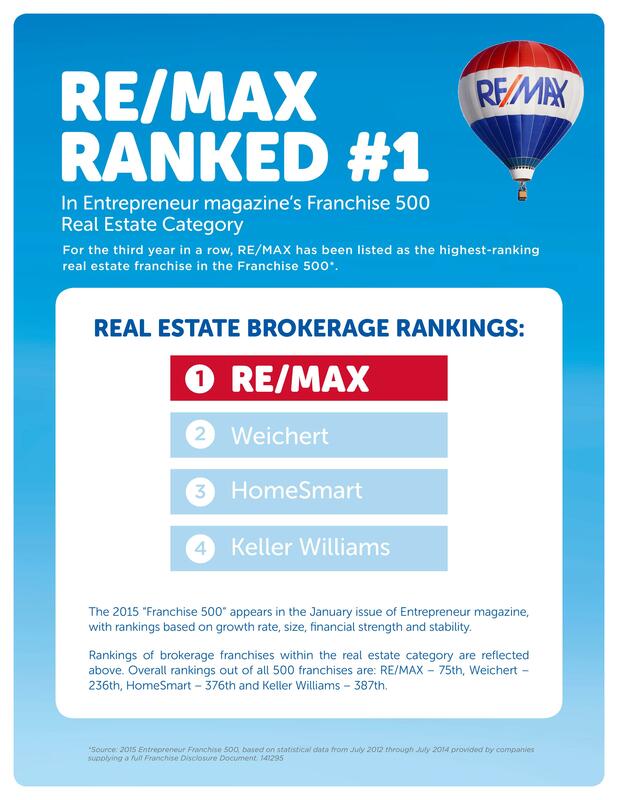 For the third year in a row, RE/MAX has been listed as the highest-ranking real estate franchise in Entrepreneur magazine's Franchise 500! 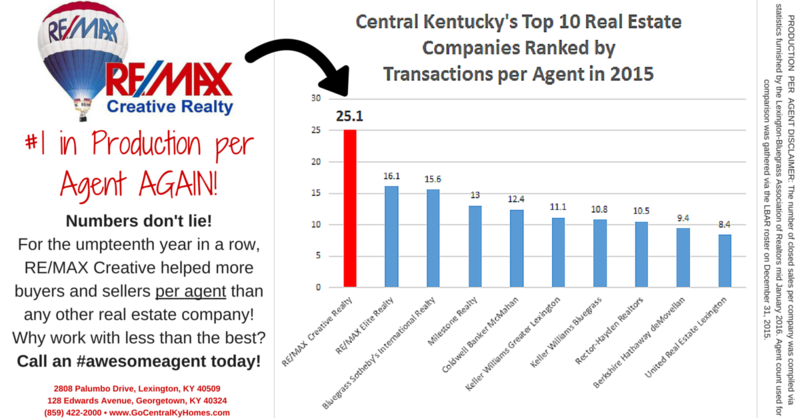 RE/MAX Creative Realty is proud to announce that once again we ranked #1 in Production per Agent in 2014 in the Central Kentucky real estate marketplace! In honor of his installation ceremony on January 14, 2015, we are excited to share a news appearance by LBAR President (and RE/MAX Creative agent) Larry Freels! (out of 10 total from Lexington). RISMedia 26th Annual Power Broker Report! and #621 (ranked by sales volume) in the NATION! Click below for the full report, then scroll to page 21 for the good stuff! 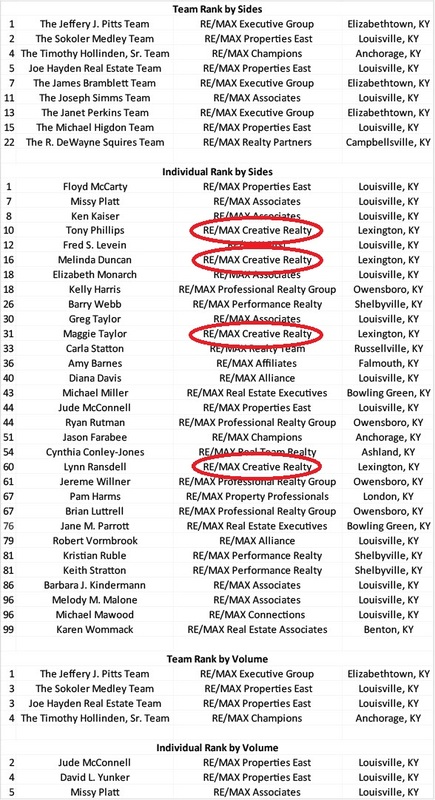 Lexington, KY June 23, 2014 – RE/MAX Creative Realty, one of the most successful real estate companies in Central Kentucky, ranks among the 50 most productive real estate brokerages in the U.S., based on home sales data in the prestigious 2014 REAL Trends 500 survey. RE/MAX Creative Realty was the only Central Kentucky real estate brokerage included among the top 50 U. S. brokerages when measured by the number of transaction sides per sales associate. 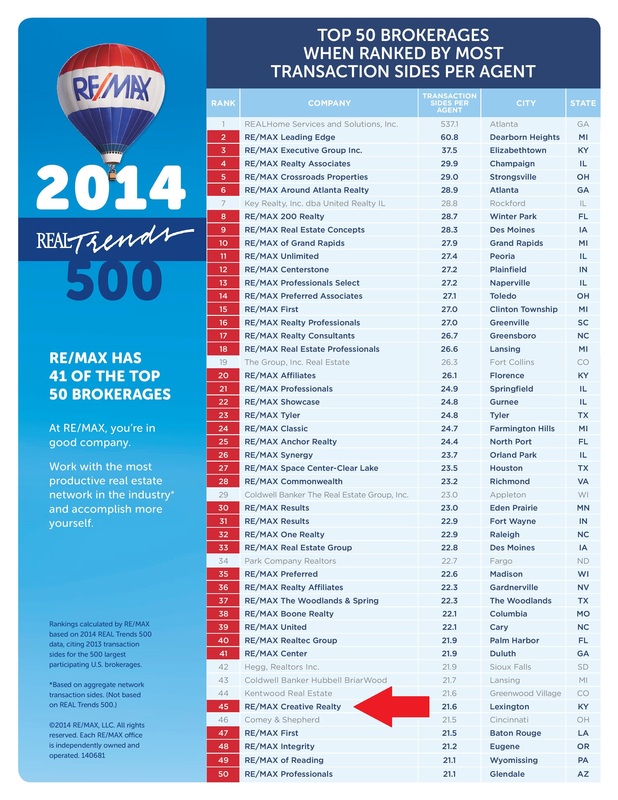 Of the 50 brokerages, an impressive 41 were affiliated with RE/MAX. RE/MAX Creative Realty ranked in the top 50 with over 21 transaction sides per agent. The survey ranked 1,451 participating brokerages by the total 2013 residential transaction sides. Among the top 500, RE/MAX calculated the 50 brokerages averaging the most transaction sides per agent. RE/MAX Creative Realty has three full-service offices and works with buyers and sellers in all Central Kentucky counties. For more information, to see the latest property listings, or to contact an agent, please visit www.4222000.com or call (859) 422-2000. To find out more about the REAL Trends 500 survey, please visit: www.realtrends.com. RE/MAX Creative Realty was founded in 1987 and is a top-producing real estate brokerage focusing on buyers and sellers of residential, new construction, luxury homes, farms, acreage, multi-family, investment, and commercial properties throughout Central Kentucky.